The best part of every road trip usually happens the moment you put the map down and in this case, let your foodie instincts be your guide. 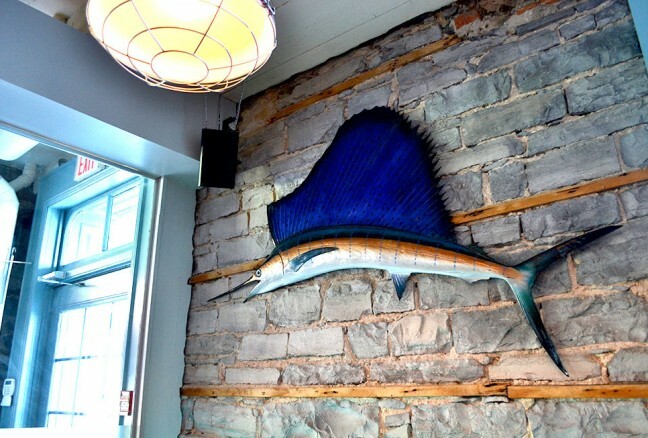 The culinary spot you will stumble upon in a historic downtown Kingston building is Dianne’s, as it celebrates the quintessential Canadian east coast with a hint of Baja Mexican flavouring. From fresh sustainable seafood choices, turf and tacos, this irresistible destination has made a name for itself and proud owner Tim Pater proves again that he truly has a flare for the restaurant industry in Kingston with his drive and passion, as he opens his fourth restaurant along side Atomica, Le Chien Noir and Harper’s Burger Bar. As a proud supporter of the vibrant downtown core, expect nothing less than perfection with Dianne’s as it has set the bar high. Greeted by a mermaid upon entering. Located a few steps away from the waterfront and a prime tourist hub, Dianne’s is unique in every way possible. 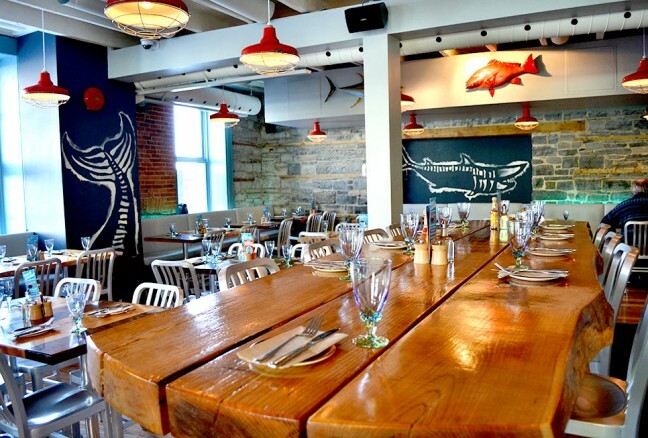 Since opening in June 2013, it has embraced the local food movement and is a big supporter of local farmers and breweries such as Gananoque Brewing Company and Muskoka Brewery. 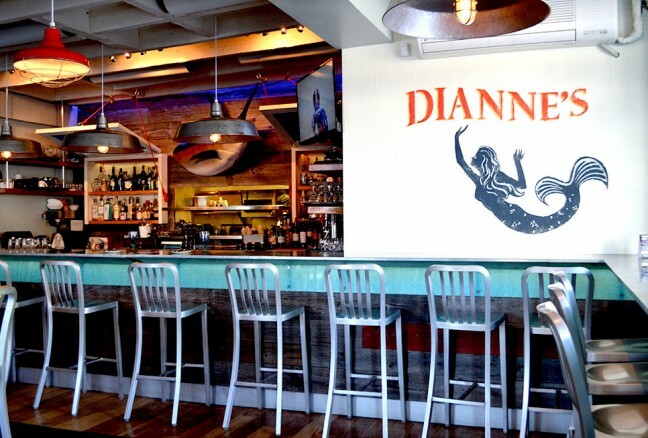 With wine on tap, over 25 kinds of pure agave Tequila and vinyl records playing in the background, Dianne’s is worth a visit if you are a seafood lover. 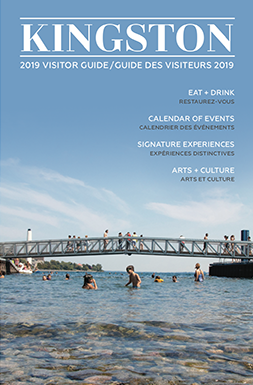 But let’s get one thing sorted out: this dining establishment offers more than your regular old fish n’ chips; lobster rolls, chowder, ceviche’s and fresh oysters are among the most popular dishes. Dianne’s is kid friendly and even offers vegetarian and gluten free options at a reasonable price. 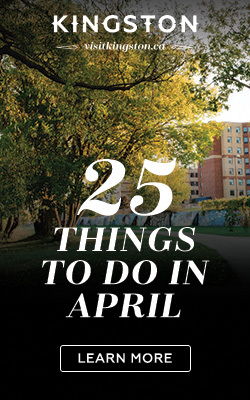 The list could go on, but the main highlight is that the Lunch and Dinner menu boasts something for everyone with a diverse selection of offerings. Dianne’s fish shack also known as the service window. Upon entering, you are greeted with an industrial modern and fresh look. To the front, a full bar area made of zinc counter, wooden panels and bubble-like glass. To the right, the main dining area with a large communal table and various seating around. 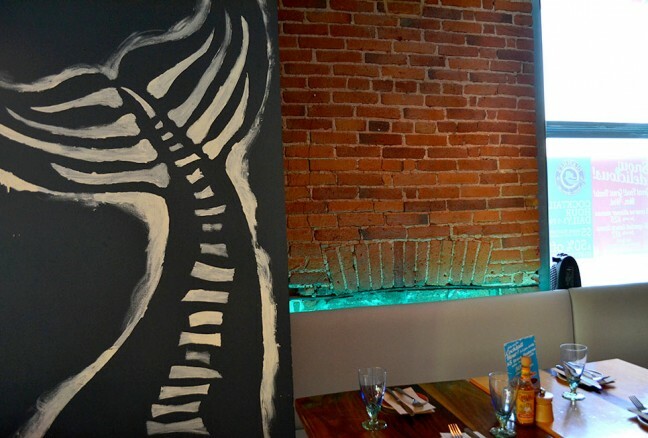 Light brick walls are seen throughout with mood lighting, perfect for a romantic night out accompanied by candlelight. 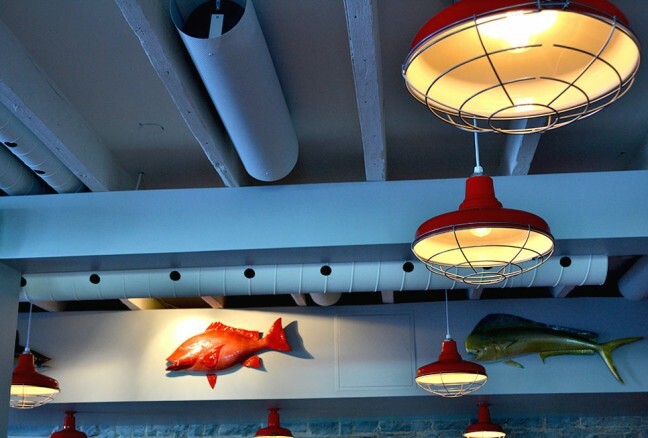 Light fixtures painted life jacket orange to stay within the nautical theme. 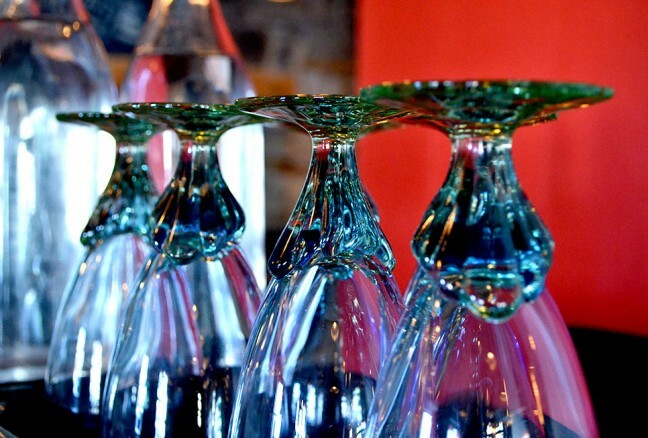 Detail is noticed in every nook and cranny at Dianne’s. 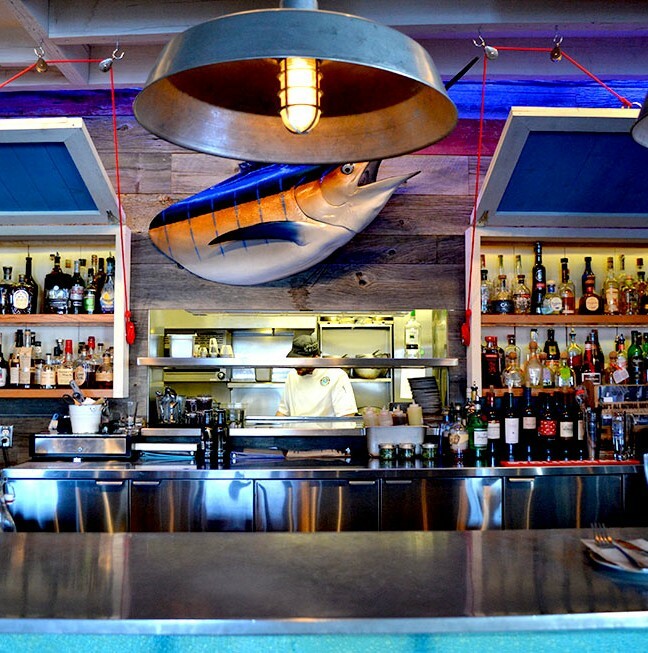 No detail is spared within the space from light fixtures painted lift jacket orange, glasses with shell detailing, and murals of fishes on the walls. The neatest part is the serving window actually resembles a fish shack you would find alongside a road out in the east coast. Coastal takeaway anyone? 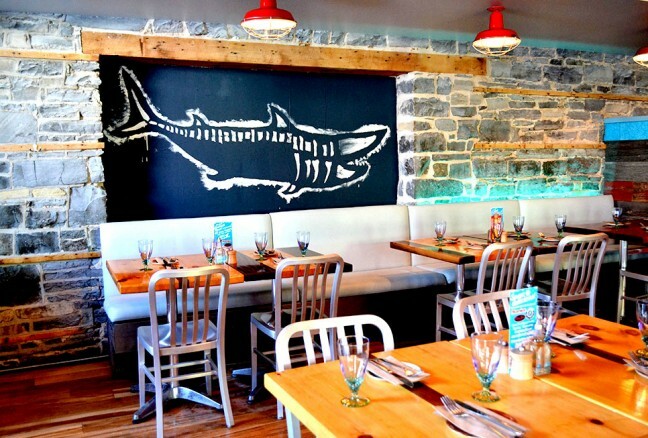 Wonderfully crafted tables by the Historical Building Co.
Chalk like murals of fish done by local student artist. Quaint area nestled in the back of the restaurant. Earlier this week, I had the wonderful opportunity to have dinner at Dianne’s with my partner and it was simply marvelous. Warning: I am a foodie and get quite excited around seafood especially. As dinner service commenced, we showed up promptly to our reservation and were seated at a quaint table at the back by our lovely server Sarah, whom I might add is a heck of a good time and knows how to make you laugh. As we skimmed over the menu, we were delighted to find out that we would be able to sample a few dishes from the menu at the chef’s request. Rather peckish, we ordered an array of dishes that included the hot crab dip, tuna poke, oysters, nachos with chile braised chicken, Baja fish taco, surf & turf and not to mention a wonderful dessert trio. I know, you might be thinking how can two people consume such amounts of food, especially when one is only 5-foot-1. Well, it was counterbalanced with my 6-foot partner and our abilities to indulge in good food over time. As per all dinner services, diners are met with complimentary fresh warm buns topped with sea salt and a side of lightly whipped butter. Firm on the outside, while light and airy on the inside with an extra pop from the sprinkled sea salt – they were deliciously fresh. Next, the crab dip was much needed with the frigid temperatures outside; it was made of cream cheese, cheddar, lemon and old bay, served with homemade tortillas and cucumber wedges. It is the perfect creamy winter appetizer that is inspired by head chef Dale’s grandma. Beware though, the dish is quite hot! Moving on, the BC Albacore Tuna Poke laced with soya, sesame, ginger, lime, scallion and chile, came with crispy wanton chips. The softness of the tuna and the crunch of the chips are different but needed, as all the ingredients infuse and complement each other exceptionally well. Known as Dianne’s specialty, you can sample all three ceviche’s for only $21! 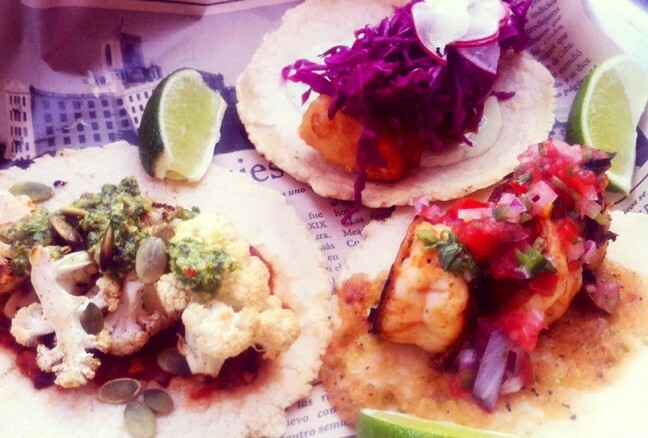 Sample all three fish tacos for $11. We also sampled fresh oysters: Northern Nova from Nova Scotia and Little Shemogue from New Brunswick. Topped with horseradish, there was definitely some added zing to the oysters. 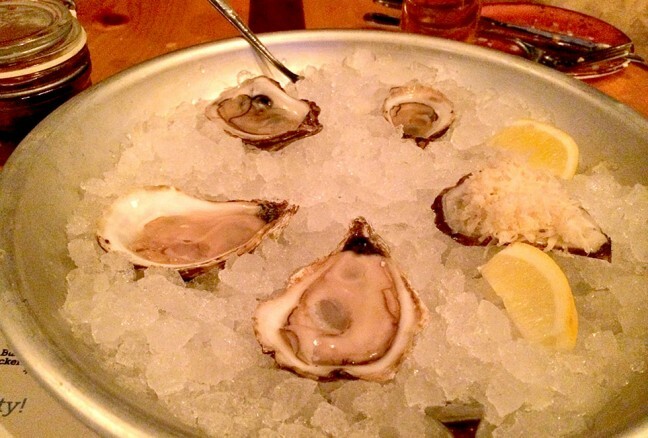 Take note that the selection for oysters varies based on season. Moving on, to stay with the winter warm theme, we tried nachos with chile braised chicken combined with house tortilla, Monterey jack, pico de gallo, banana peppers, green olives, and sour cream. The fresh toppings give this dish a hot and cold effect, and make your tastebuds sing. Next up was the Baja Fish Taco comprised of beer battered Alaskan pacific cod, pickled red cabbage, radish, and avocado crema on authentic hand-made Mexican style corn tortillas. The batter is lightly crisped and the simplicity allows for bursting flavors to shine through as you bite into it. Again, Dianne’s is on point with detail as it even serves this dish over Mexican newsprint. In a hurry, have a business meeting or are looking for a good deal? Sample two for $8, three for $11 or six fish tacos for $19! The portions are quite generous and this could be said for most dishes at Dianne’s. Northern Nova NS and Little Shemogue NB. Finally, as an end to our dish tasting and somewhat full bellies, we endeavour the Surf & Turf consisting of grilled chile spiced local strip Angus steak with spicy roasted NS lobster, jalapeño lime butter and a side of arugula tossed with tomatoes, green beans, radish, corn, avocado, queso fresco, toasted pepitas and mostaza vinaigrette. The steak was medium rare as requested and cooked to perfection, which surprised neither of us. The lobster tail was pre-dissembled and avoided a mess, which is always appreciated. This hardy meal has considerable portions again, ideal for sharing. 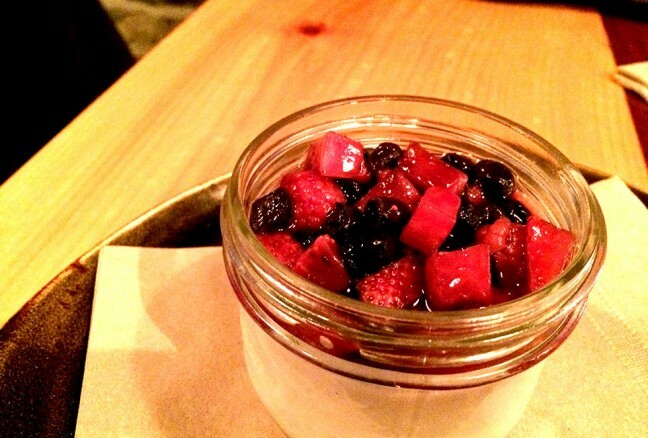 Jar of Yummy Stuff – buffalo yogurt panna cotta with mixed berries. Saving the best for last, dessert. We were presented with a trio: chocolate crème brûlée, hello dolly square, and buffalo yogurt panna cotta with mixed berries. Boy oh boy, were they good! The crème brûlée was rich and flavourful, the panna cotta was light, delicious, and to my amazement – gluten free! The hello dolly square was quite strong in coconut taste though not my cup of tea, due to nut allergies. All desserts were creative and received an A+ for presentation as they came in mason jars – hence their name of Jar of Yummy Stuff. Be sure to ask your server what they have! Through leaps and bounds, Dianne’s is still evolving and is gaining the reputation as THE place for sustainable fish lover dishes with a modern twist. Two thumbs up for local Kingstonians and tourists alike. Whether dining as a couple or with friends, don’t just order single dishes for each person, be adventurous and share! Most items on Dianne’s menu are perfect for doing just this! Give it a try! 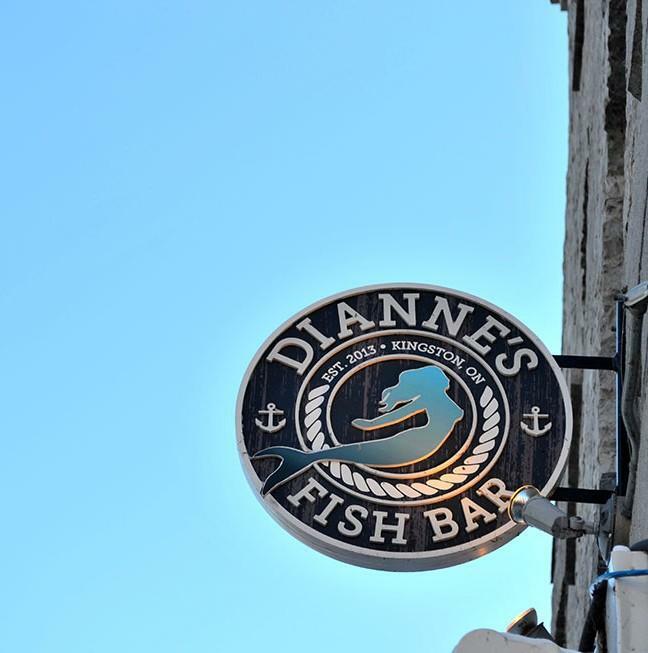 Be sure to stop by Dianne’s Fish Bar at 195 Ontario Street, Kingston.